Beth Adams is a graphic designer, writer, painter, and the founder of Phoenicia Publishing. Her watercolor that appears on the cover of Night Willow was originally published on her blog, along with a story, which Luisa Igloria then used as inspiration for her prose poem of the same name. 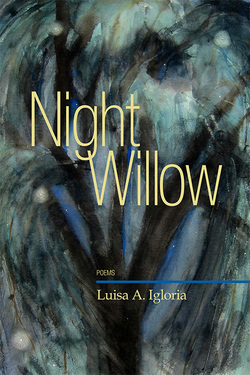 Phoenicia Publishing is proud to announce the publication of Night Willow, by the celebrated poet Luisa A. Igloria. In this shining and unsparing new collection of poems, Igloria draws from her own childhood memories, relationships, and keen sensory awareness to create a dreamlike series of pictures in which we, too, may see our growth through the experiences of joys, loss, and the poignant wisdom that comes with age. As poet Sean Thomas Dougherty puts it, Igloria's poems "get to the heart of why poetry is written: the pure lyric impulse of trying to live." ...Luisa A. Igloria establishes herself as a singular and revelatory voice in American poetry. ...Her engrossing poems hide, behind their gorgeous scrims, a bristling wall of spears. LUISA A. IGLORIA is the author of Ode to the Heart Smaller than a Pencil Eraser (selected by Mark Doty for the 2014 May Swenson Poetry Prize; Utah State University Press); The Saints of Streets [reviewed at The Rumpus] (University of Santo Tomas Publishing House, 2013); Juan Luna’s Revolver [reviewed at Lantern Review] (University of Notre Dame Press, 2009 Ernest Sandeen Prize); Trill & Mordent(WordTech Editions, 2005); and eight other books. She holds degrees from the University of the Philippines, Ateneo de Manila University and the University of Illinois at Chicago, where she was a Fulbright Fellow from 1992-1995. She teaches on the faculty of Old Dominion University and currently directs the M.F.A. creative writing program. Since November 20, 2010, she has written (at least) a poem a day; the poems are archived at Dave Bonta’s Via Negativa site.